One of the most beautiful islands on the planet. Ibiza attracts the best DJs in the world to its tiny island. Fat Boy Slim, Swedish House Mafia, Tiesto, Eddie Halliwell and Judge Jules have all played in the clubs and at Café Mambo. One of the most amazing experiences of my life watching the sunset from Café Mambo looking out on to the Mediterranean sea. Thousands of people gather outside Café Mambo and Café Del Mar yet the atmosphere is quiet and calm among the travellers and tourists. I have been twice and both times had a difference experience. The second time (2011) our last night we sat in Café Mambo restaurant will all of our baggage drinking a cocktail listening to 'Sweet Harmony by The Beloved' me Jenna and Victoria began to cry because it was such a beautiful moment. Have you ever had that?.... Amazing.. If you are planning to go to Ibiza I would stay in Ibiza San Antonio bay or Playa d'en Bossa they are alot quieter than San Antonio and away from the crazy strip. If you do get up before midday you must visit the wonderful hippy markets in Ibiza. Famous for its exotic jewellery, clothing & textiles from places like India, Indonesia & South America. The best markets are Punta Arabí Hippy Market on Wednesday in Es Caná and the Las Dalias Hippy Market on Saturday in San Carlos (See above). One of the top attractions in Ibiza and I bought some really nice gifts for relatives back home. If you plan to go to one of the amazing nightclubs out there (nowhere like them on this earth) book your tickets in advance or get them from official store in San Antonio. They are alot cheaper. You could pay as much as 90 euros on the door, in advance (35-40 euros) before you go print out the Ibiza spotlight calendar for the weeks that you are there. Tells you who is playing where, when and how much. For me Space, Amnesia & Pacha are the best clubs. We visited 'Space' on Carl Coxs 10th Anniversary. Wow what a night! Each room with a different theme, different music and electric atmosphere. For me visiting 'Amnesia' was a must (the film 'Kevin & Perry' go large filmed here, see above pic) one of the most electric atmospheres. Beautiful girls dancing on stages all around the main room, large screens projecting beautiful imagery of music and Ibiza, big DJs live mixing and sometimes together! We watched Laid back Luke and Calvin Harris. Awesome sounds. Be careful though this club had a dark side to it, I saw girls who had been spiked with drugs. Always keep you eye on your drink and always leave the club with all the other girls and don't get into strange unauthorised taxis. The best transport and safest is the bus which picks you and drops you at San Antonio. 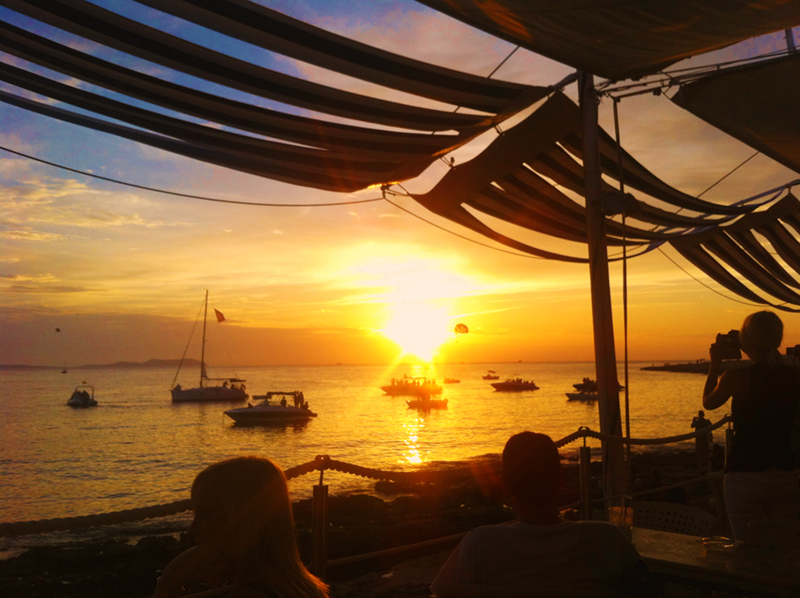 Ibiza has plenty of offer & truly is amazing to visit. The sunset for me was worth the flight alone.